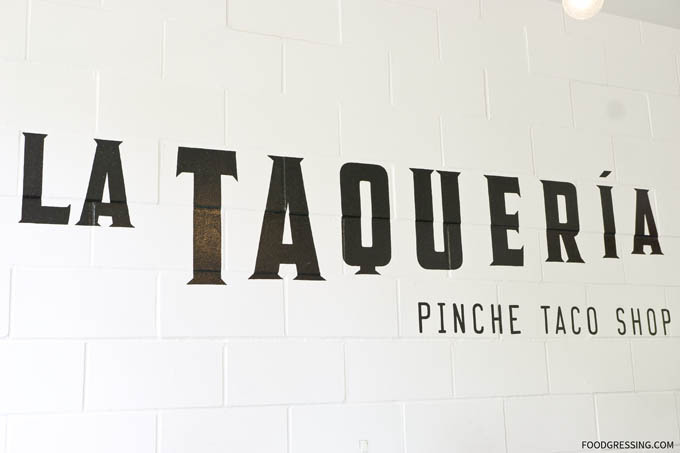 If you’re a fan of La Taqueria, you’ll be happy to know that the popular eatery has opened a new location at Main Street and Broadway. 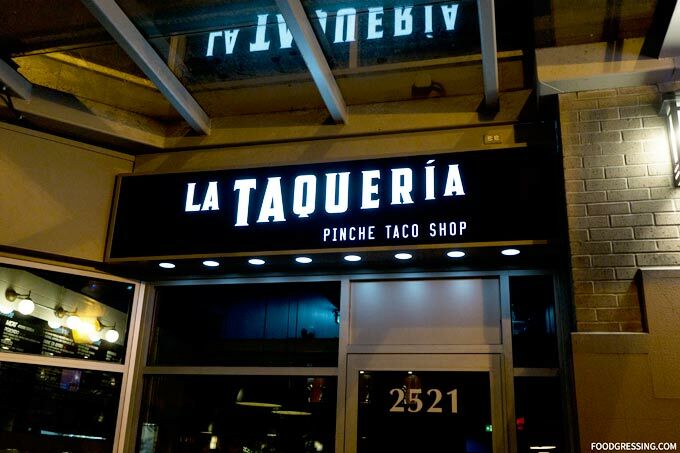 This marks the fourth location of La Taqueria in Vancouver and sixth overall. Taking over the space formerly occupied by Miura at 2521 Main Street, La Taqueria’s newest location features a beer-and-cocktail program and a brand new menu item: mouthwatering nachos loaded with Guadalajara-sourced cheese and toppings like housemade jalapeño pickles, onions, and dressings. I attended a grand opening celebration of La Taqueria Main Street last night. Here’s a look at what you can expect. 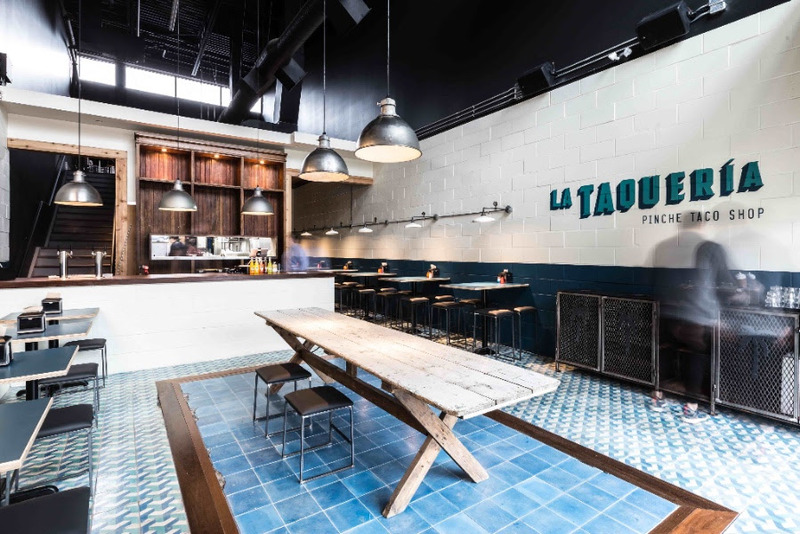 The interior of La Taqueria Main Street features dual-tone palette of teal and navy, graphic tilework and ceramics imported from Mexico, and mix of vintage and reclaimed-wood accents. 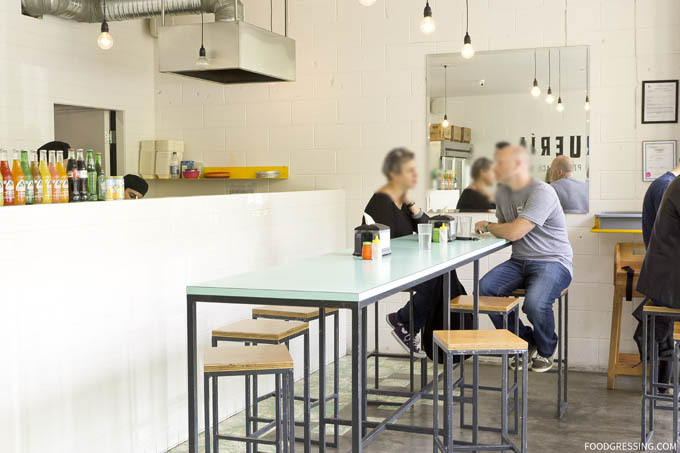 You’ll find a large communal table, some high top tables, and a few smaller dining tables. 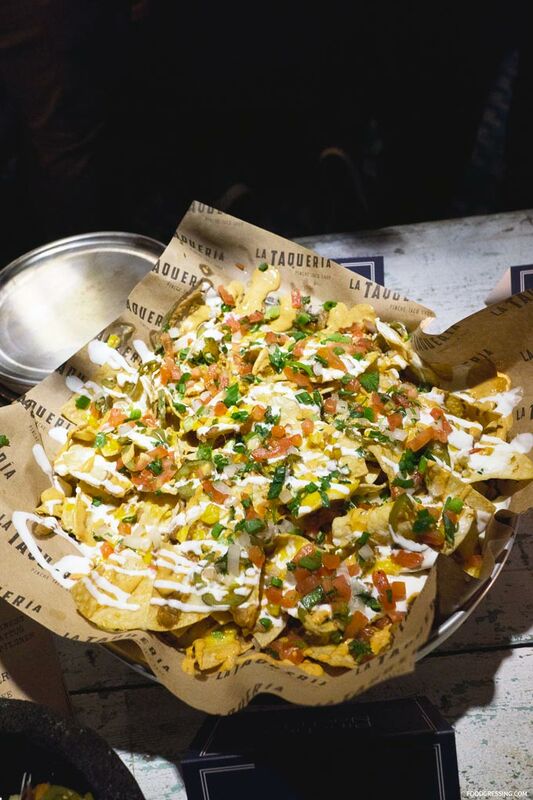 Debuting at La Taqueria Main Street are three tier, doubled-baked house nachos made with corn chips, Guadalajara-sourced cheese, refried beans, onions, jalapenos, sweet corn, sour cream, pico de gallo and creamy chipotle sauce. 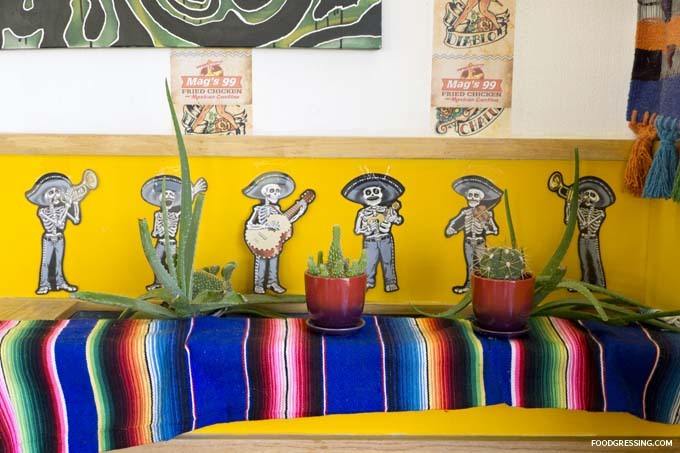 Patrons of La Taqueria’s other locations will also enjoy old favourites like their authentic Mexican meat, vegetarian and vegan tacos. 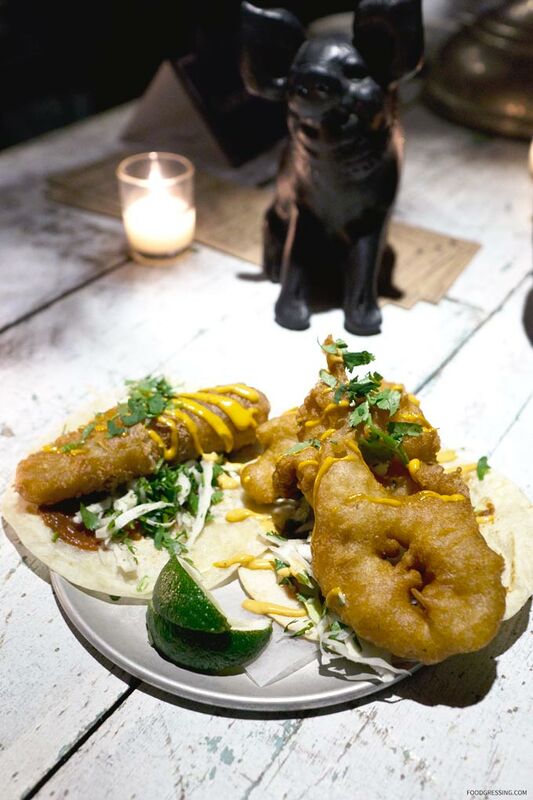 At the event, I tried the Baja (tempura beer battered seasonal fish) and the Cabo (tempura beer battered prawns) tacos. Hope everyone had a delicious #NationalTacoDay this past week! 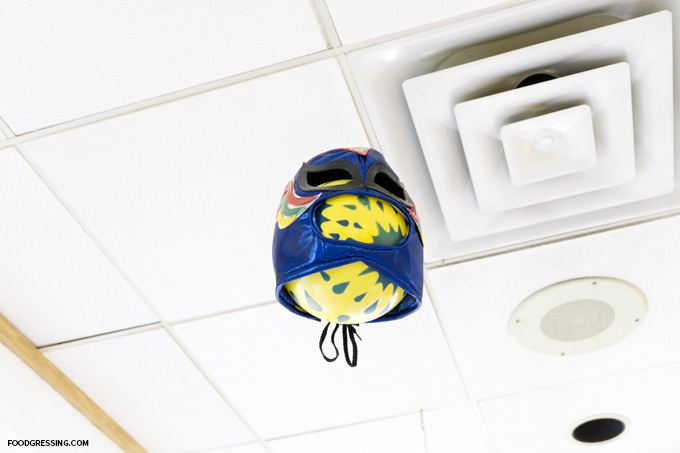 I celebrated at La Taqueria‘s location on Hornby at a media event where I indulged in their tacos. My favourite was the Cabo featuring taco tempura beer battered prawns. How did you celebrate #NationalTacoDay? Let me know in the comments below. Disclosure: All food in this review was complimentary. 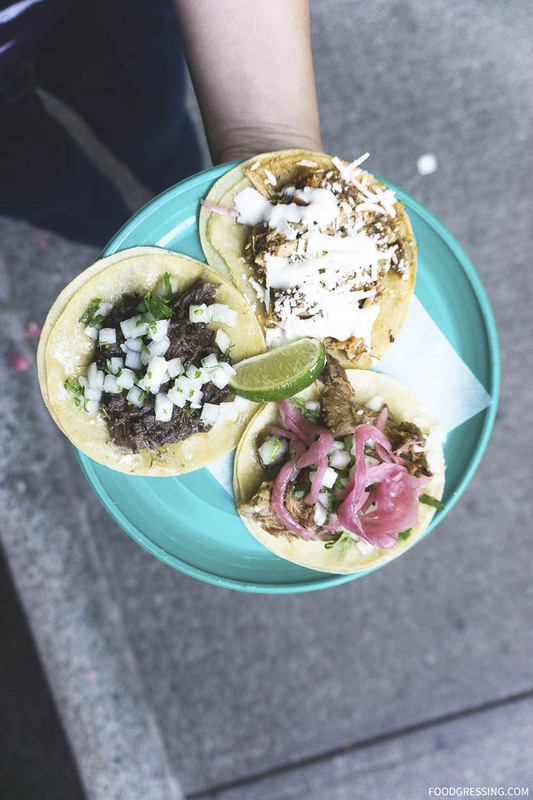 Tacomio in Gastown has been around for over two years now and that is impressive considering that Vancouver has numerous popular taquerias already. I had been accumulating quite an amount of referral credits for foodora so I decided to apply some of it to try Tacomio this past summer. Note: None of the food in this review was complimentary. This review is done anonymously. All opinions are my own. 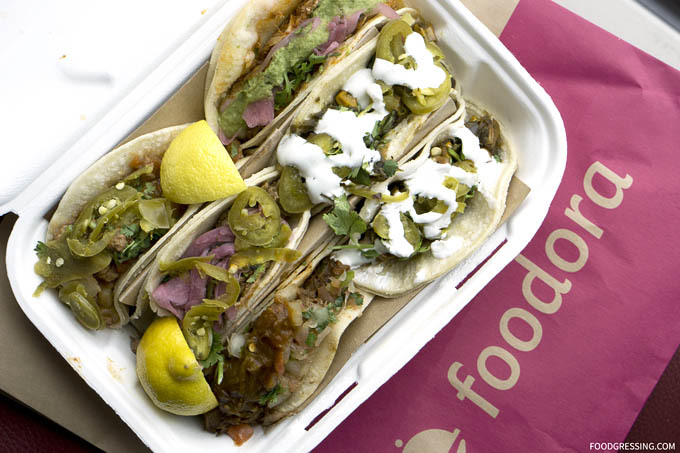 I had ordered 6 tacos from Tacomio via foodora for $18 which is more expensive than what you would pay at the restaurant ($15). The tacos came by delivery as I had been feeling rather lazy to drive over there to pick them up. The tacos I tried where: 2 x Rajas Con Crema (corn), Carnitas (pork), Picadilla (beef), Puerco Borracho (pork), and Tinga (Chicken). I’m a regular at La Taqueria and Rajas Con Crema (creamed organic corn, poblano peppers) is my favourite taco flavour. I didn’t like Tacomio’s version as much because it wasn’t as sweet and creamy compared to La Taqueria’s and rather more on the savoury, peppery side. As for the other tacos – Carnitas (pork), Picadilla (beef), Puerco Borracho (pork), and Tinga (Chicken) – they were OK. Portions of meat were reasonable and so was the flavour. I still feel the tacos at La Taqueria are more flavourful, more saucy and the meat is more moist. I must admit that I am a fan of tacos from La Taqueria. For me, they are *the* place to go for tacos in Vancouver. 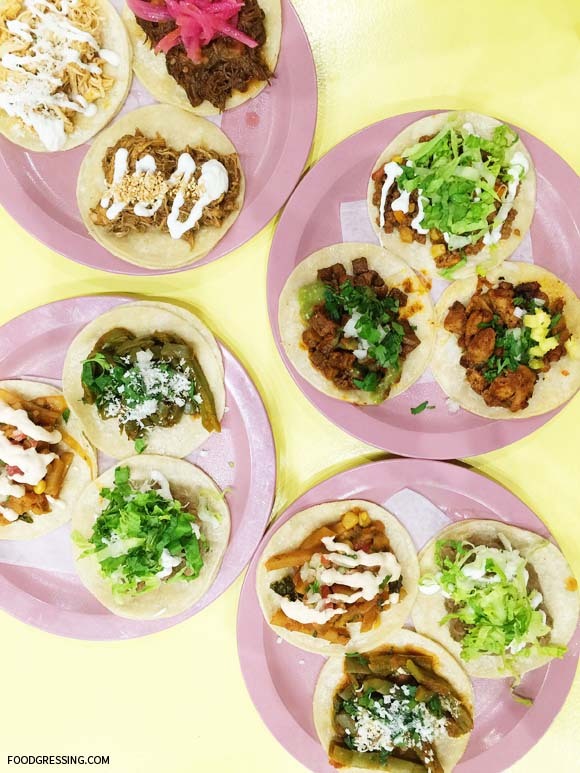 It is not always convenient for me to get to a La Taqueria location, so I have been searching for a go-to taqueria in my ‘hood – the West End. I had previously reviewed Molli cafe on David and Burrard and thought their tacos were pretty good. This time around, I decided to try out Los Amigos Taqueria on Davie. .
At the family-owned Los Amigos, you can get 4 meat tacos for $8.99 in chicken (Tinga, Mole, Al-pastor) or meat (Lengua, Carne Adobada, Bistec, Picadillo) varieties. Unfortunately, they do not serve pork tacos (carnitas). 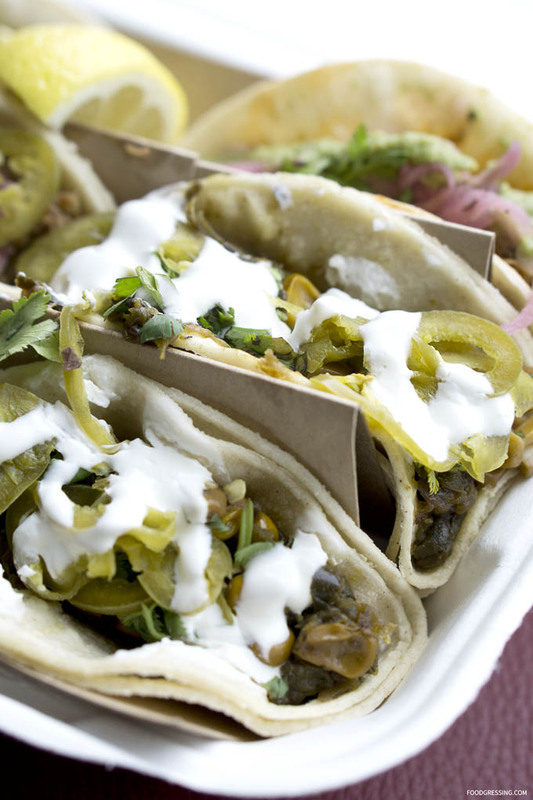 They also offer 4 veggie tacos for $7.25 including Rajas, Super Veggie, Nopales and Frijoles. Three other signature items are available: fish (pescado) taco, quesadilla and pozole soup. 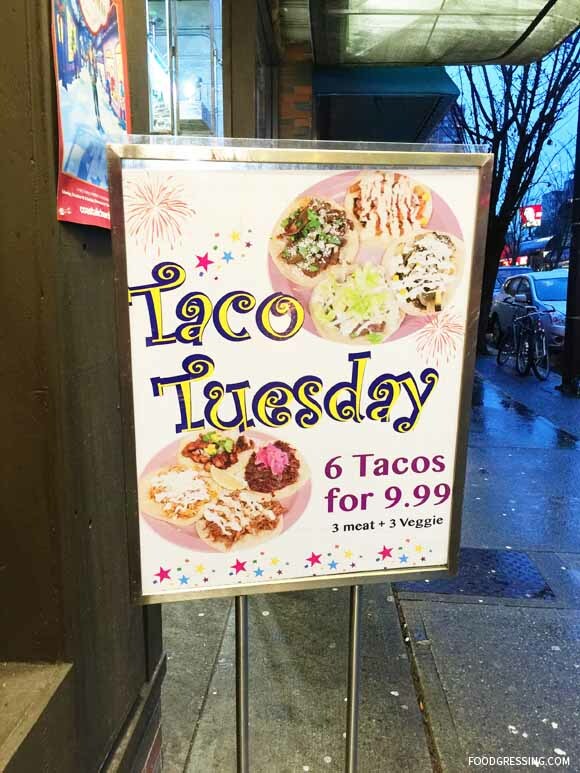 On Tuesdays, they have a special for 6 tacos (3 meat and 3 veggie) for $8.99. Zomato has an image of their menu online here. Over the two visits, I tried 7/8 of their meat varieties and 4/4 of their veggie tacos. On the first visit, I went with the 4 for $8.99 meat tacos deal, choosing three chicken (Mole, Tinga, and Al-pastor) and one veggie (Rajas). 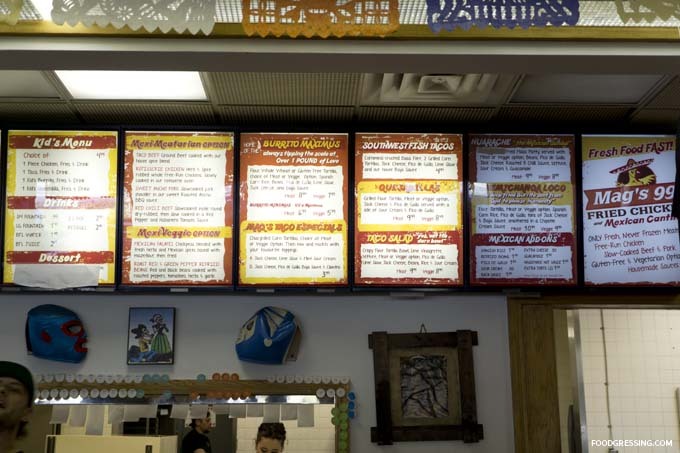 On the second visit, my husband and I got two of their Tuesday Specials (2 x 6 tacos) and ordered pretty much one of each type (except for Pescado which is $1 extra). All in all, we found the tacos to be good but smaller in portions and less flavourful than La Taqueria. Some highlights were the Mole and Frijoles. I enjoyed the slightly sweeter taste of the Mole; it is made with shredded chicken in mole sauce with a slight hint of chocolate topped with sesame seeds and sour cream. On the veggie side, the Frijoles (refried beans topped with sour cream, Mexican cheese and onion) appealed to me the most. The beans were in a thick paste and I quite enjoyed the texture. My least favourite was the Rajas which had roasted poblano pepper. It had a mild pepper flavour with just enough heat to be zesty, but the taste was not particularly enjoyable to me. In terms of portions, I think 6 tacos would be the best for a meal. 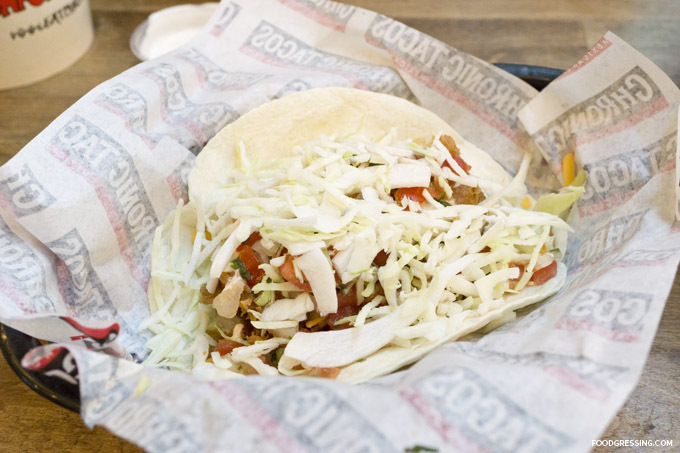 4 tacos, though for $8.99, is more like a snack/light meal. On thing to note is that Los Amigos Taqueria is a very small eatery such that they don’t actually have a washroom for customers. My hands were messy after eating but there was no washroom or a sink available. They did have a hand sanitizer dispenser but it was empty. I really did wish I had baby wipes that moment! 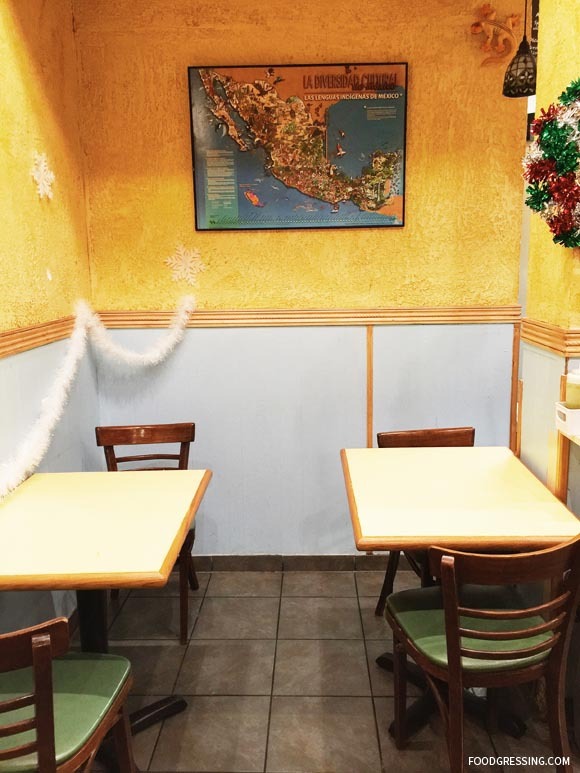 For more information, visit the Los Amigos Taqueria at their website and social media: Facebook, Twitter, and Instagram. 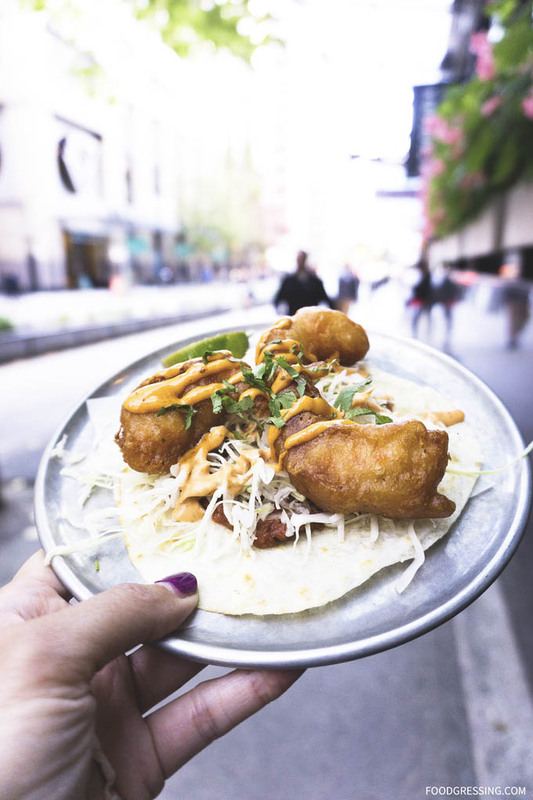 If you are enroute to Whistler or visiting the Sea to Sky Gondola, you might just consider Mag’s 99 Fried Chicken and Mexican Cantina for a bite to eat. 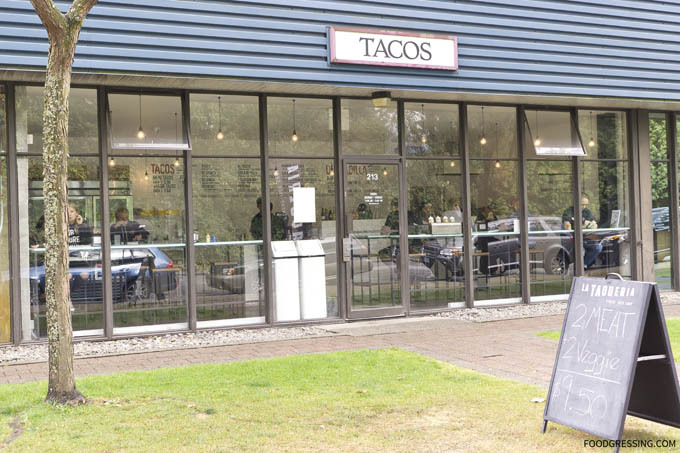 This locally owned eatery in Squamish serves up some cheap Mexican eats that leaves you fully satisfied. I went to Mag’s for the first time recently after an afternoon of hiking at the Sea to Sky Gondola. Mag’s is highly rated on both Zomato and Yelp, and my experience there gave me insight as to why it is so popular. Mag’s 99 Fried Chicken is conveniently located just off Highway 99 (like their name suggests). 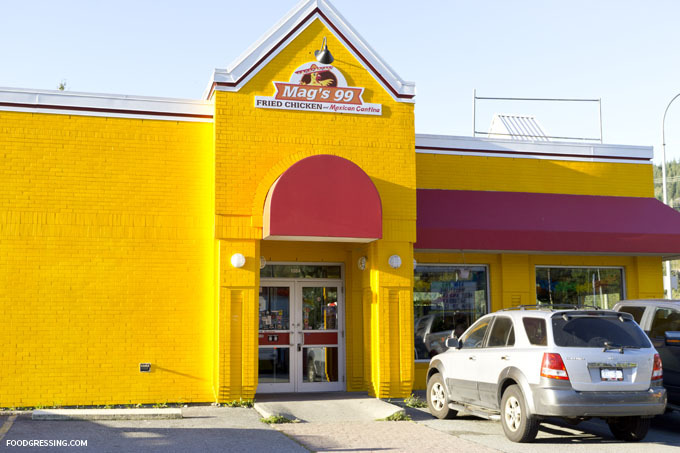 Mag’s is easy to find by look for their its bright yellow exterior. It is also located next to a Shell station. Others have noted that Mag’s occupies the space of a former KFC/Tacobell. 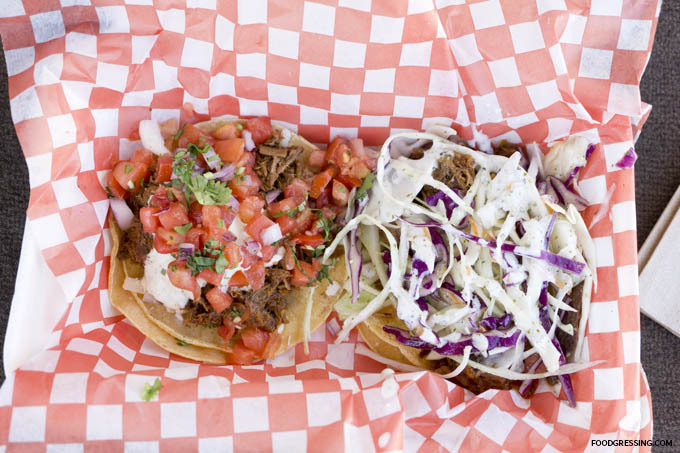 Aside from fried chicken, Mag’s tasty array of Mexican eats include tacos, burritos, quesadillas, taco salads, hurraches, and chimichangas. Meatarians can indulge in free-run chick or slow-cooked beef and pork. They also have gluten-free and vegetarian options including falafels and refried beans. Mag’s Burrito Maximus is “over 1 pound of love” while their Chimichanga Loco is a “deep fried burrito sent from God to please humanity.” Everything is inexpensive with items costing around $10 or less. 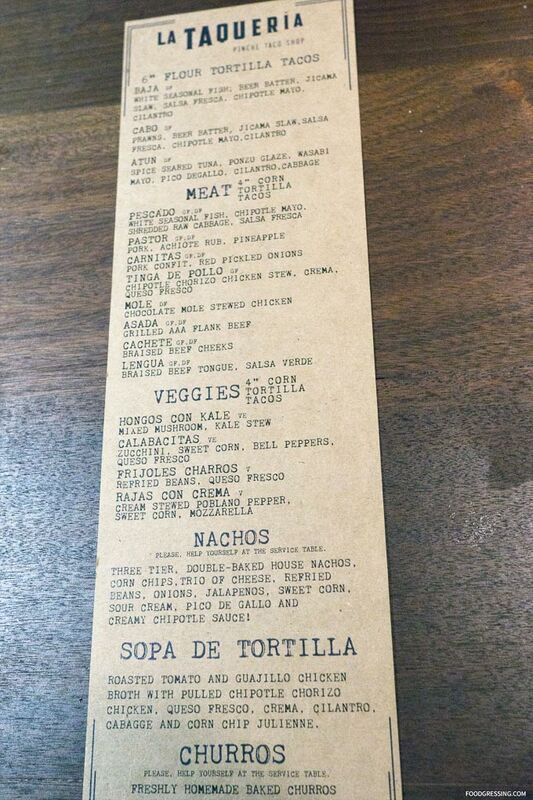 For a higher-resolution photo of the menu, click here. The unique decor inside Mag’s certainly adds character to the place. I was really inspired to photograph them because they looked so interesting. Where do I begin? 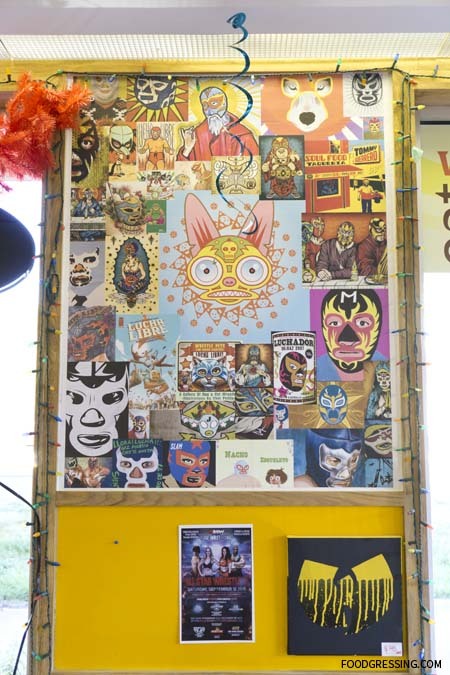 To start, I noticed some lucha libre references with the wrestling masks hanging underneath their menu and strung from above as well as in a collage on the wall. 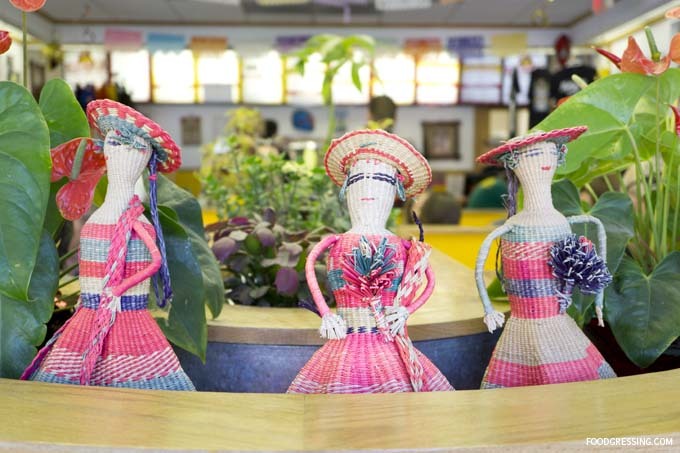 Some Mexican woven dolls overlook the dining area. 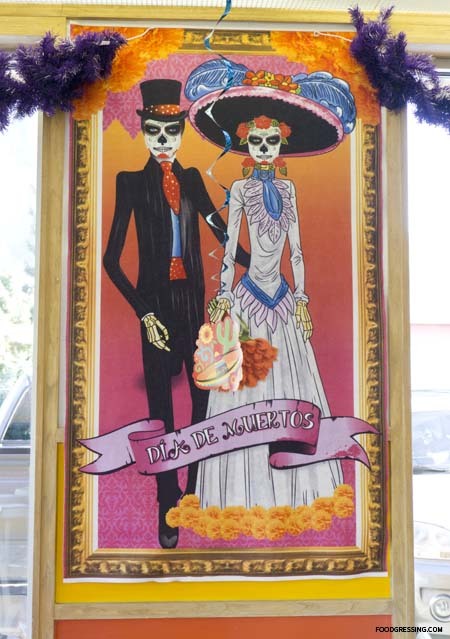 Finally, we have some Day of Dead art prints rounding out the interesting decor. The seating inside is typical of a fast-food joint with booths and tables. It was formerly a KFC/Taco Bell after all! The restaurant was busy and we opted to get takeout which seems to be a very popular choice. I was given a number after paying and waited around the counter with other hungry customers for take-out. We had two tacos on chargrilled corn tortillas which were each for $3.99. First was the slow-cooked red chili beef with red pepper and Habanero tomato sauce. Next was the slow-roasted sweet ancho pork in roasted BBQ sauce. 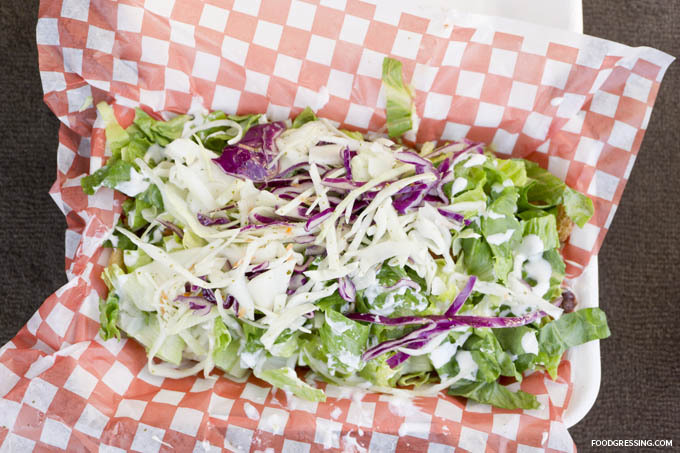 There are two options for toppings: jack cheese, lime slaw, and mint sour cream or jack cheese, pico de gallo, baja sauce and cilantro. 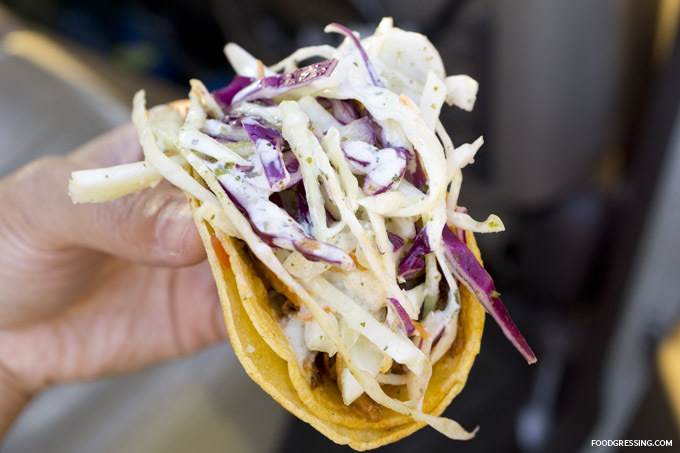 We tried them, respectfully, on the tacos. 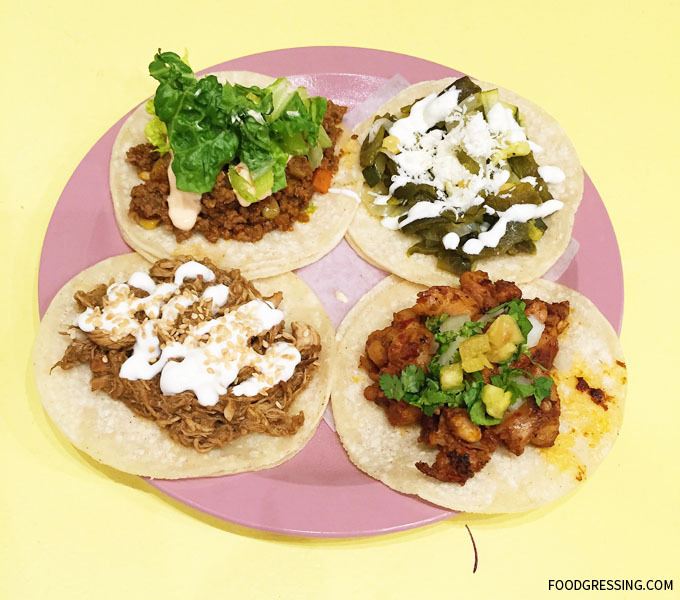 The tacos were deliciously juicy and flavourful, with both slow-roasted meats tasting on the sweeter side. 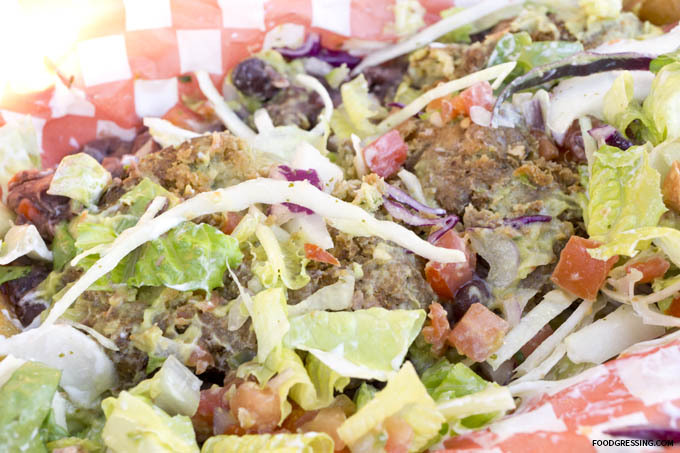 We also had the falafel option for the hurrache also known as the “Mexican Sandal.” It came with a fried masa patty, beans, pico de gallo, jack cheese roasted 5 chilli sauce, lettuce, sour cream and guacamole ($8.99). At first look, it looked like a large salad but fortunately I found the falafel and masa patty. The hurrache was a “messy good” – that is a mish mash of ingredients thrown into a takeout container with really no distinct flavours but still confusingly tasty. 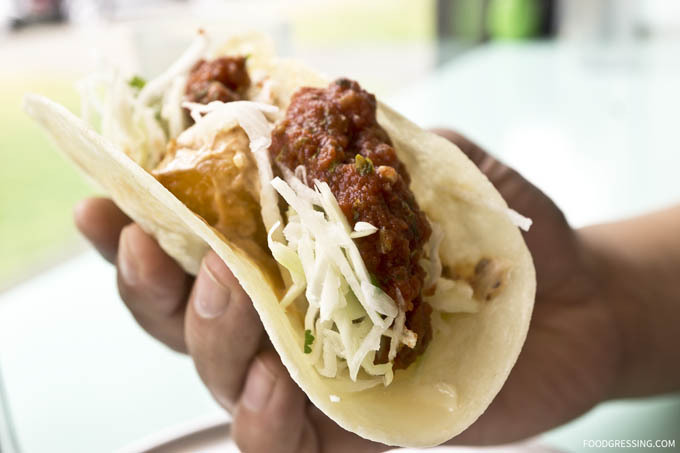 At Chronic Tacos, it’s all about fresh Mexican food made from authentic third generation recipes and customized to each customer’s palate. Founded in 2002, the California-based company has more than 30 locations in North America and two locations right here in BC (West Broadway and New Westminster). 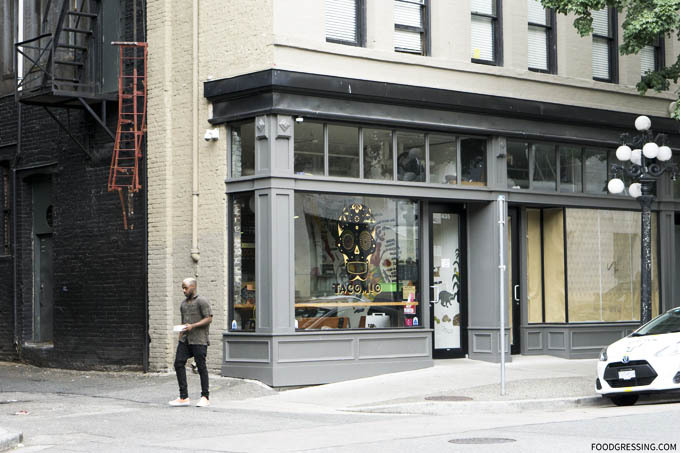 Their plans for expansion include a third BC location which is slated to open this fall in Metrotown. I was recently invited to a media event at the Chronic Tacos on West Broadway where we sampled a few of their menu items and learned more about the art of making guacamole. 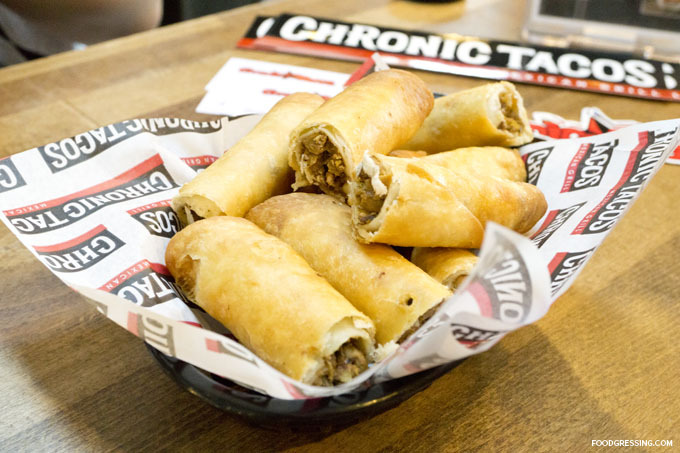 Chronic tacos offers traditional Mexican items such as burritos, tostada bowls, tortas, taquitos, flautas, salads and tacos, including a breakfast menu all day. 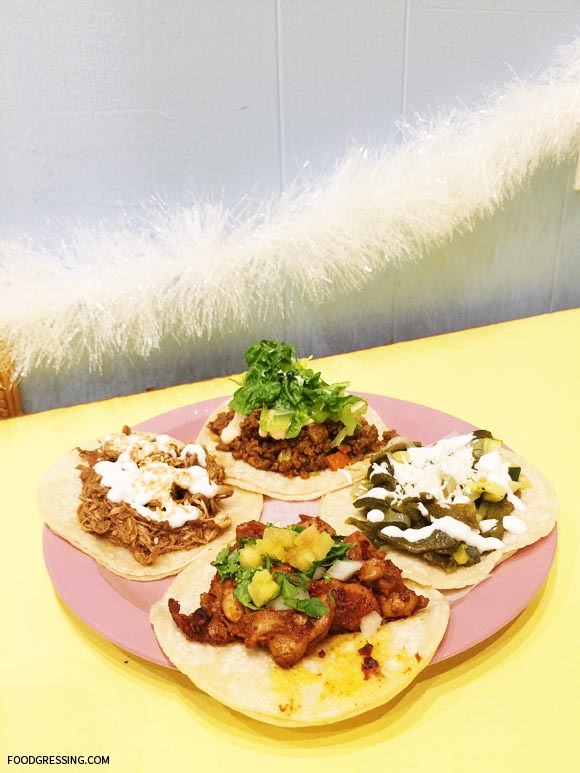 Customers can choose from vegetarian and gluten-free options, as well as carne asada (steak), pollo asado (chicken), carnitas (slow-cooked pork) and al pastor (spicy marinated pork). For the seafood lover, there is also grilled, beer-battered or baja-style fish and shrimp. 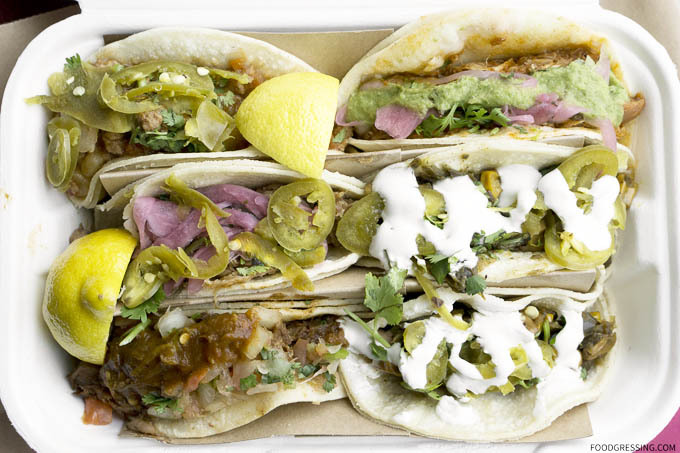 When it comes to the ingredients, Chronic Tacos is committed towards using the highest quality, locally sourced products and all-natural proteins. Their menu is available online. 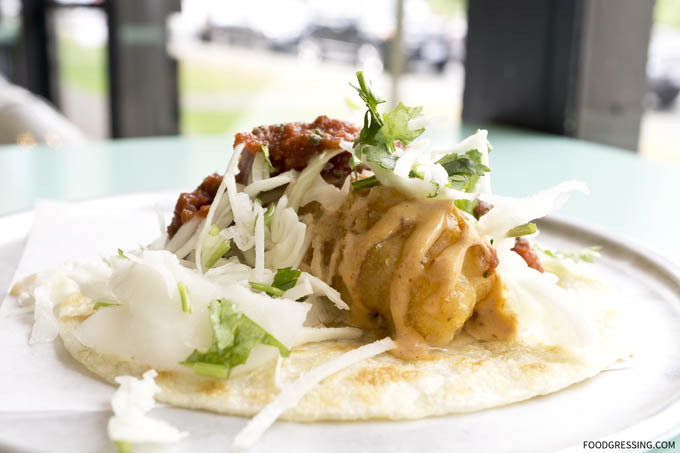 At the event, we tried a fish taco on a flour tortilla with a heap of fixings. We also had a Chronic favourite, the flauta. The flautas come in either chicken, carnitas or beef and are mixed with bell peppers, cheese and onions hand rolled in a flour tortilla. They are then deep-fried to perfection. 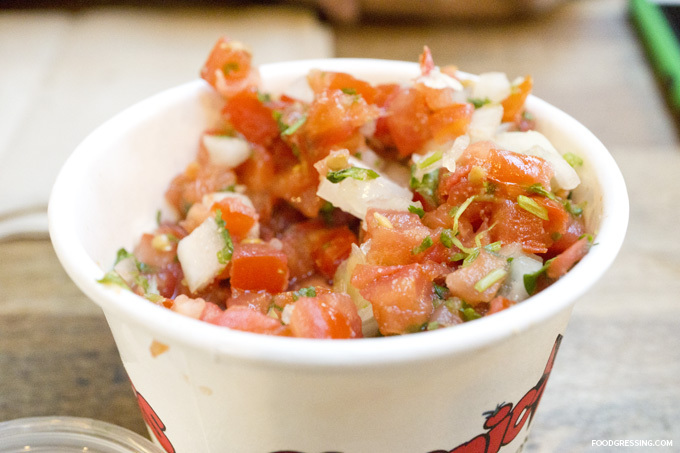 Made fresh daily, their salsa is delicious with tortilla chips. 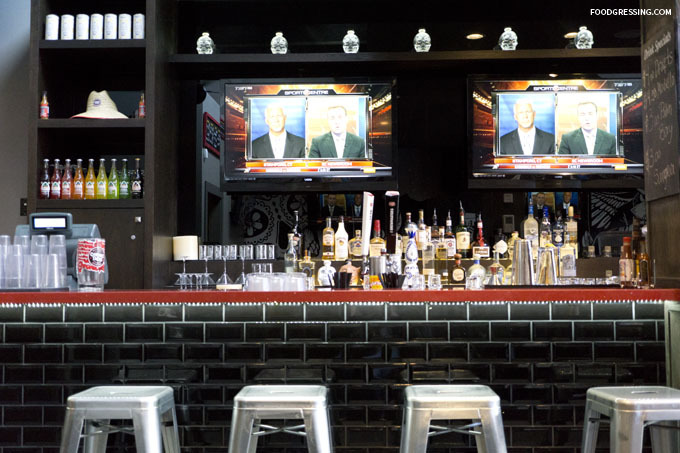 Chronic Tacos also offers a variety of Mexican beers and Mexican sodas. 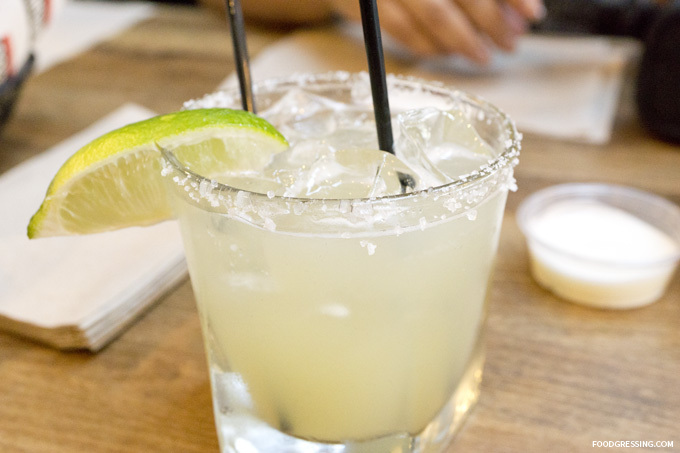 At West Broadway, they have a bar featuring tequilas and authentic margaritas. At the event, we tried their wonderful and tasty lime margarita. 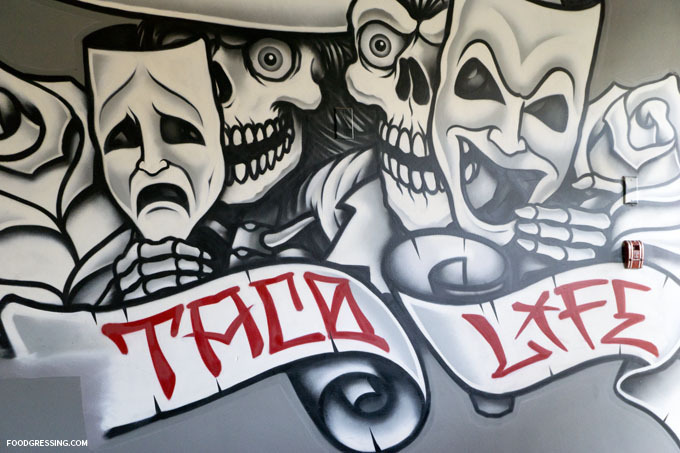 Each Chronic Tacos location also features “Day of the Dead” art creating a unique experience. 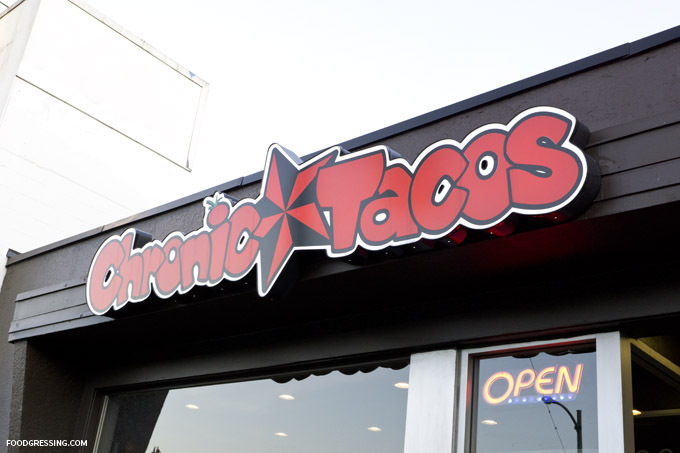 Thanks to Chronic Tacos, I will be giving away three $10 gift cards to the Chronic Tacos located at 382 West Broadway in Vancouver. There are two winners from the entries through the blog and one winner through Instagram. This giveaway is open to BC Lower Mainland residents only and ends Friday, September 25 at 23:59 PST. All entries will be validated and winners will be chosen by random. For more information on Chronic Tacos, visit them online, Facebook, Twitter and Instagram.